Silver, casting, engraving, embossing, gilding. 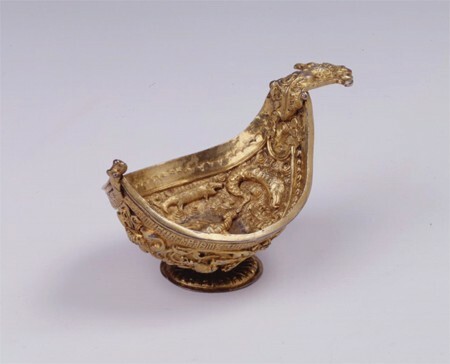 These small dippers on bases, so-called korchiki, were widely used in Russia as drinking vessels for serving strong drinks. They came into service in the XVIIth century in Russia and became widespread and available for different strata of society thanks to a reasonable price of production. Korchik similar in form to the Russian kovsh resembles images of swimming birds. 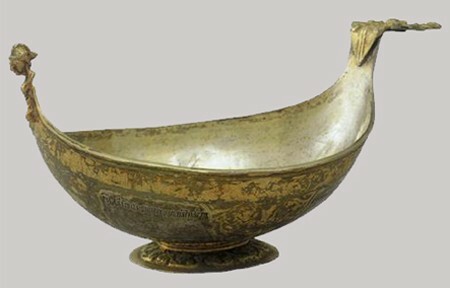 The inside and outside of the korchik were usually decorated with embossed ornament and precious stones; its spout was finished with casted bead or sculptural embellishment in form of a flower or mask; rims of these dippers bore engraved inscriptions with names of their owners, with exhortations or wishes.